If Europe wants to grow again, the Euro must decline. The Eurozone PMI data continues to be crappy, as expected, but the Euro holds firm. 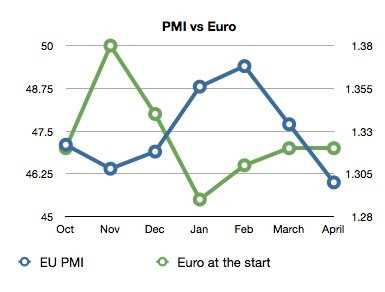 The above is the Manufacturing PMI against the Euro/Dollar since Oct. But the Composite PMI, which pretty much mimics the EU GDP, holds a similar pattern. The above chart argues the decline in the Euro should have started happening two months ago. Regardless of what I think, the Euro will have to see a repricing downward sooner-than-later.